This week we have another giveaway for you to enter and this one you can keep for yourself and use to combat all the stress the holidays bring about. We have 5 eyeSlices to giveaway ($19.99 value each) for 5 lucky winners. 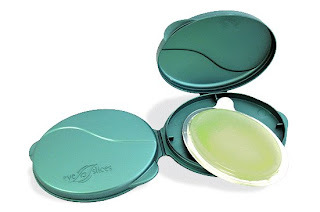 eyeSlices® are innovative eye treatment pads that combine the natural essence of nature with bio-innovation to bring about an all-in-one solution to all common eye concerns. eyeSlices® is a global first in cryogel polymer technology. These dermal delivery eye masks reduce the appearance of red eyes, dark circles under eyes, tired eyes, wrinkles and puffy eyes within 5 minutes of use. These professional spa and in-home anti-aging eye skin treatments lock in moisture and are unique in that they provide an instant cooling sensation without a fridge and are re-usable! To enter the giveaway, send us an email at beautyinreallifecontests@gmail.com with "Eyeslices Giveaway" in the subject line. Be sure to include your full name and mailing address. We will randomly select five winners November 19th at 11pm est. The winners will be announced on Thursday, the 20th! Alright, just to clarify...One entry per person, duplicate entries will not increase your odds of winning. For this giveaway, only US residents may enter. You have from now until November 19th at 11:00 PM EST to enter. To find out a little more about eyeslices, check out www.eyeslicesusa.com. *Please Read This: In entering this contest you are giving us permission to forward your name and mailing address to representatives for Eyeslices for fulfillment and mailing of contest prize(s). If you fail to include that information we will disqualify your entry. Five winners, chosen at random, will receive the prize mentioned. Duplicate entries will not improve your chances of winning. Giveaway sponsored by Eyeslices. Some restrictions may apply. Open only to US residents only...sorry. Entries will be accepted through 11:00 pm on Wednesday, November 19th, 2008.